VietNamNet Bridge – About 300-500 tons of medical waste, including 45 tons of hazardous medical waste, is discharged to the environment everyday. Only about 50 percent of hospitals have medical wastewater treatment systems. The figures have been released by the Environment Management Administration under the Ministry of Heath at a workshop held recently. While the volume of medical waste is large, Vietnam only has 200 incinerators to handle the waste. There are only concentrated incineration enterprises in Hanoi and HCM City, while those in other cities and provinces are small and medium-sized. The 200 incinerators now in existence treat medical waste from 435 hospitals, or 40 percent of the total hospitals throughout the country. It is estimated that 33 percent of hospitals in districts and provinces don’t have specialized incinerators. The daily waste from the hospitals has been treated with small-scale incinerators or handled by the businesses under the contracts with the hospitals. As such, of the 350-500 tons of daily medical waste, only 1/3 could be burnt with dedicated incinerators with advanced technologies. A high proportion of the remaining waste is buried on the hospitals’ campuses, or thrown into public dumping grounds, often near residential quarters, posing a big risk people’s lives and health. Dr. Nguyen Huy Nga, head of the administration, warned that the question of how to treat medical waste will continue to be a headache for the watchdog agency, especially with the volume of medical waste forecast to rise to 930 tons by 2020. This means that Vietnam will have to allocate a bigger budget for medical waste treatment. Currently, Vietnam pays VND1.2 million per hospital bed annually to ensure environmental sanitation. Analysts assert that the figures are just estimates. In fact, there are many other unofficial ways medical waste has been disposed of after leaving hospitals. Colonel Tran Trong Binh from the Ministry of Public Security, pointed out that at many hospitals, normal medical waste and hazardous waste are put into the same place. As a result, hazardous waste has also been brought into the environment together with domestic waste and medical waste. 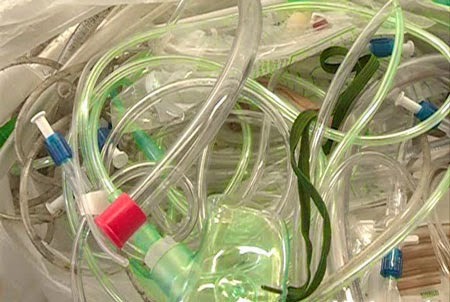 Medical waste, such as used gloves and injection needles, bandages and plastic tubes, can also be taken by hospital workers who exploit management loopholes. They bring them to the market, where they can be sold as high-quality materials for recycling. A local newspaper has published reportage showing that the used products, after being carried out away from sickrooms, were collected by small merchants. The products are brought to “craft villages”, including Trieu Khuc, where they are sorted and recycled to make consumer goods. Also according to Binh, a big volume of medical waste never leaves hospitals or is never treated, because it is buried within the hospitals’ premises. The C49 Agency of the Ministry of Public Security has recently discovered that a clinic in the Hoang Mai District of Hanoi disposed of its medical waste in the public dumping ground, despite having signed a medical wastewater treatment contract with Bach Mai Hospital.